Vladimir Monomakh fails to launch Bulava missile? Vladimir Monomakh submarine of the Project 955 Borey class returned to Severodvinsk on September 14, 2015 after four days at sea. The submarine left the port on September 10 and, according to notifications issued by Russia, was scheduled to launch a Bulava missile from the White Sea some time between 11 and 15 of September. However, since there was no report of the launch it is reasonable to assume that something did not go according to the plan. Well may be. But the areas looked like the ones for a Bulava launch. And the timing (Sep 11-15) was a bit ahead of the exercise. In any event, the question mark in the title is there for a reason. We don't quite know what happened. 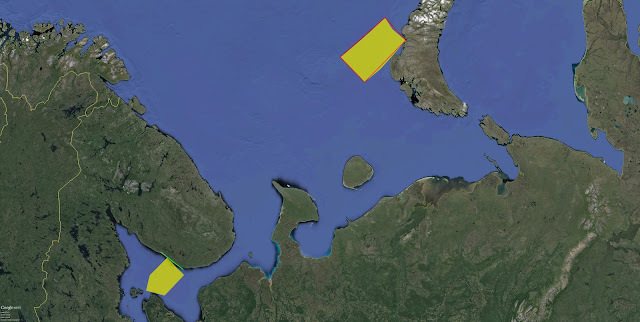 There was plenty of CW (morse) traffic on the White Sea frequencies over this period, with position reports given around the exclusion area. There also seemed to be some guard ships at the entrance to the White Sea.